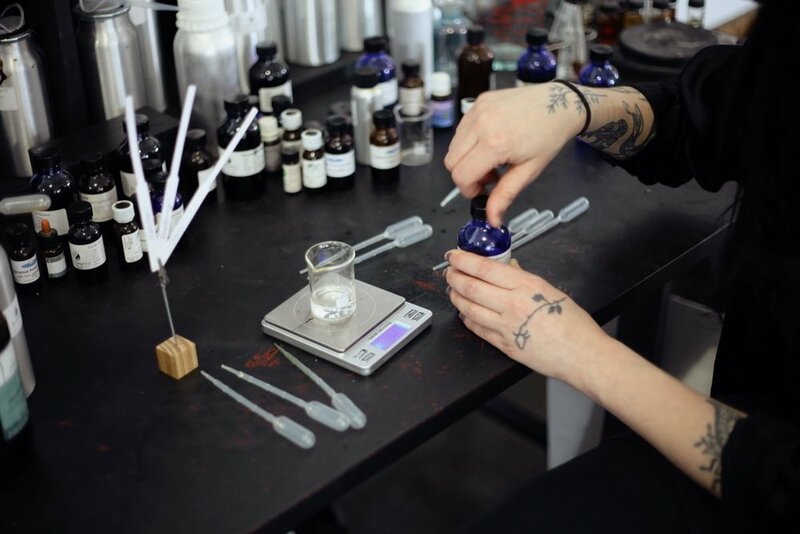 The New Noses is a series on independent perfumers who came upon the craft the unconventional way: who aren't French men, heirs to perfume empires, or trained in prestigious fragrance schools. Today, a conversation with April Lea—the brains and nose behind Montreal's beloved natural perfume brand, LVNEA. "I’ve been running this business for four years. It started after I went on a tour with a friend of mine, who sells art and leatherwork. I assisted her as she did events all over the US, and sold some of my own stuff there. It was received really well, so as soon as I came back [to Montreal] I opened up my Etsy. For me, starting a perfume business was easy, because I was doing freelance photography and had the time to work on other projects. And once the perfume projects started bringing in income, I was able to say no to more photography gigs, and only do the ones that I wanted to do. I slowly transitioned over until I was like, “No, this is all I want to do.” It was definitely a privilege, already having a career where I was in control of my own schedule. I do all my own photos. Since I went to art school, a lot of how I build concepts is drawn from that. The photography that I studied was fine art photography, and it was all about conceptual thinking. That definitely helped. It obviously also helped with the logistics of doing branding and shooting—the visual aspect of the business. As for the darkness in my work, it's mostly a reflection of myself. I’m always in black, always. It’s just what I find visually pleasing. No matter what kind of work I’ve done, even in my photography, it’s dark and moody. It’s just what I like. The most challenging part is finding yourself, all of a sudden, having a BUSINESS and having to do everything. I went to art school! Accounting, bookkeeping—I didn’t learn any of these things. I’m still learning and making mistakes along the way. Even now. Just keeping everything together and running smoothly without getting overwhelmed is the most difficult part for me. If I could just make things, that would be the fun part. That aspect I don’t find challenging at all." "In the beginning it was all self-taught, through books and trial and error. I have taken some classes and studied with Charna [Ethier]—she’s a natural perfumer based in Rhode Island. Her company is called Providence Perfume Company, and it’s all natural perfumes. She’s been doing it for a long time. I’m going to see her again soon, to do a more advanced class—she allows you to bring stuff that you’ve been working on, and she’ll tell you if it’s worthwhile. I’m bringing samples of new stuff I’m working on. It’s cool because you don’t usually get the opportunity to have a professional—someone else who’s in the business—critique your work. The way that I approached perfume initially was from the natural side. It wasn’t like I had this intense desire to create perfume, exactly: I was making soaps and natural products with a friend of mine, and I was mostly interested in plants and essential oils. And the more I got into it, the more I would explore the rare essential oils. Those can be really expensive, so it’s not something you want to use in a soap or a lotion. That’s when I started making perfume. I don’t necessarily believe this is the only way—I know that essential oils can be just as harmful if not used properly. There’s a lot of debate around this, but it’s just my preference. It’s also what I’m familiar with working with; I don’t know anything about aromachemicals. I like knowing that this oil came from a plant. That connection to nature makes it a bit more special to me. Also, I’m interested in the old world techniques and inspired by it, so that’s another reason why I prefer natural oils. I want to get into get into distilling myself. I just got this copper still—I want to distill some herbs and different Canadian conifers and materials. For me, the LVNEA customer is not necessarily someone who is really into natural perfumes. It’s just an added bonus for some people. I’m not really in the natural beauty community; that’s not how they find me. And honestly, when I’m making stuff, I don’t have an audience in mind—I’m making things for myself. That’s why a lot of things are very dark, these heavy woods and resins. They’re not easy fragrances for everyone. I tend to like heavier, more resinous smells: woods, forests, leathers, spices." "This is the first eau de parfum I’ve ever made. I don’t necessarily wear it all the time, if I had to pick a favourite, it would be it. It has one of my favourite essential oils in it, which is piñon. It’s a type of pine tree from the Southwest—it only grows in arid climates, and it makes these really resinous pine cones that drip with resin. They distill the cones with the resin and a magical essential oil emerges. It’s got a bit of sweetness in it, too. Sometimes I start from an idea or a name, and I work with scents that I think will fit that concept. Sometimes I’ll approach it the opposite way, where I’m like, “Oh, I really want to make a cannabis perfume,” and I’ll try to build a story around that. For L’Etranger, for example, I had the concept and the name first. I wanted to make something nostalgic around the idea of a passing stranger who smells familiar, who gives you déjà-vu. Like you’ve met them before, but you can’t pinpoint where. It has tobacco, vanilla, oakwood, bergamot, these very comforting and familiar scents. The future of the line is something I go back and forth on, because I’m not always sure. Because my brand was basically built on social media. Initially, I did go on that tour, and got the word out there, and that’s how I met a bunch of people I later connected with on Facebook and Instagram. But now that all these platforms are flooded with people making things, selling things, I really want to bring it back to a more community-based model, and try to reach out to the people around me. Because over the years, doing things like souk@sat, I have grown a bit of a following. I think it would be cool to open a physical store in the city and do—I’m speaking five years down the road here—classes and workshops and things."